4 yrs ago I was given a restoration project to do I handed it back on Sunday. Hebrides born, English Oak, well worn and used, parts missing and broken. Hi Ginger Nut, loks like you did a good job and got it back together , did you take more photos of the process ? 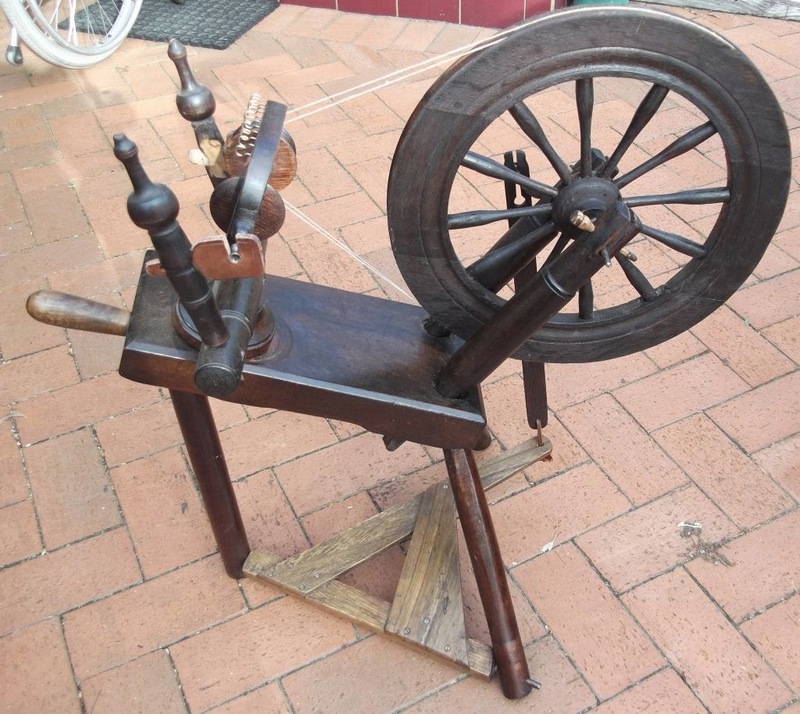 Its just a friend of mine is wanting to make a spinning wheel so any detailed photos would have probably bee of interest to him. Thanks for posting this. It bought back some memories of the one my father made for my mother. The details were similar I remember being fascinated by it and seeing the leather bearings and hinges as well as the other mechanical joints in wood really brought it all back. Great job. When do you get your woollen jumper? Wow great job! You kept it looking its age, but now in fine operating condition and finish. Hi micktoon thanks. Yes plenty photos over on the blog http://woolnwood.blogspot.com.au/ of the resto If you search spinnig wheel it should bring up all the links/posts done so far, for both resto and of the new build/copy. There is a major flaw with the design of the flyer on the old one from all photos and info it went on for years in builds the same. I will rectify on the new one that is the length of the area from the orifice to the U over the bobbin I am making that distance 10mm shorter to clear the castle of the whorl and bobbin. The whorl has to line up with the wheel so some alterations there too. Until I make the wheel up I can't go any further to see how its going to line up. I can do a list of measurements if need be and also there are links to wheel designs FREE on the net for different styles and sizes. Thanks vtsteam this was one of my main anguishes as having been involved with restorations of vehicles where the comments are always "how much is new how much is original?". The resto here has 1 new leg it was missing, footman/treadle to badly damaged, connecting rod poor replacement previously , adjustment knob old one could possibly have been repaired as it was so worn easier to make the new one, the locating pins these were originally Hawthorn some missing others broke when removing them. My wife is trying to find a 'travelling' spinning wheel. She's made contact with a local spinning group and is intent on spinning some of the wool from her Jacobs sheep. Shearing is happening this coming Sunday if weather permits. Hi Ginger Nut, thanks for posting the reply, I think there might be something wrong with the link as I am on Samsung tablet and as the page from the ling was loading it wiped all my pre set tabs that were open and went back to the home screen, all the tabs were gone and when I tried to load the page again it set the tablet back to home screen ? So I can not get to see the link but the section I did see looks very good. Can everyone else see it ok ? I can open it, but the background image (sky and foliage) is so wide that even on my wide screen laptop I get sliders so I have to shift the whole page to see it all. Looks like the background image is a fixed (and too large) width. It should adjust to window size. Might be a blog template problem. Now thats a good idea she can still heard sheep and go on holiday and take the wheel with her as a bit of a stir you could always make her a drop spindle in the mean time. LOML has a range of these usually made from left overs or off cuts approx 3" dia depending in weight of timber 3mm to 10mm thick or smaller with a shaft of 8" to 10" a notch at the top and she'll have a travelling spinning device. Mick I will check it out on LOML's laptop latter tonight and check the template for the blog also. I have noticed it at times before but not recently. efrench care to elaborate in a separate thread? This is madmodders after all! We want to see one. Hi Ginger Nut thanks for looking into it , I tried to look again and the same thing happened as your link was loading, it gets so far then wipes all the tabs I have on the tablet , ( say 5 ) and puts me back to the desktop type screen, I then have to open all the tabs I had from scratch again ? Bloody typical as I would like to see it and also pass on the link but my friend who is making a spinning wheel he is 82 years old and is very limited on the computer so I dont want to risk a mishap when he loads the page as he only just manages to do the basics anyway. LOML would cast a magic spell on me if I even tried it. Mick sorry for not getting back sooner not been to well last few days and NO I didn't forget to check using the laptop. All was well on it I can assure you, using Firefox, XP on the laptop etc. I have had no other complaints from many who have gone to view that particular Post or the blog itself. Hi Ray , it looks like its the tablet more than being a Geordie as you susspected, I have tried on the PC and it come up ok ? , starange but at least I can view it now, Looks good so thanks for taking the time to do your blog , I will pass on to my friend that is into spinning wheels. Mick thats good you had me worried for a bit. I am on doing the newer wheel the copy and will post here if and when as LOML just said to put its completed. Its al but there so it should weather permitting during the winter here soon. Sorry just saw your post and checked the link. LOML would throw that at me tell me to go try again, the box would be ARPIA, the dial speed control just use a sewing machine foot pedal much easier. I like the space saving with 3 spinning wheels in the house now, 3 looms of various sizes from 2 shaft to a floor loom plus the new build spinning wheel I am making.